Philip Henry Sheridan(March 6, 1831 – August 5, 1888) was a career United States Army officer and a Union general in the American Civil War. His career was noted for his rapid rise to major general and his close association with Lt. Gen. Ulysses S. Grant, who transferred Sheridan from command of an infantry division in the Western Theater to lead the Cavalry Corps of the Army of the Potomac in the East. In 1864, he defeated Confederate forces in the Shenandoah Valley and his destruction of the economic infrastructure of the Valley, called "The Burning" by residents, was one of the first uses of scorched earth tactics in the war. In 1865, his cavalry pursued Gen. Robert E. Lee and was instrumental in forcing his surrender at Appomattox. Sheridan was commissioned as a brevet second lieutenant and was assigned to the 1st U.S. Infantry regiment at Fort Duncan, Texas, then to the 4th U.S. Infantry at Fort Reading, California. Most of his service with the 4th U.S. was in the Pacific Northwest, starting with a topographical survey mission to the Willamette Valley in 1855, during which he became involved with the Yakima War and Rogue River Wars, gaining experience in leading small combat teams, being wounded (a bullet grazed his nose on March 28, 1857, at Middle Cascade, Oregon Territory), and some of the diplomatic skills needed for negotiating with Indian tribes. He lived with a mistress during part of his tour of duty, an Indian woman named Sidnayoh (called Frances by her white friends), daughter of the chief of the Klickitat Tribe. Sheridan neglected to mention this relationship in his memoirs, and a primary source recalls that Sidnayah died in 1847 at age eight, well before Sheridan arrived in Oregon. He was promoted to first lieutenant in March 1861, just before the Civil War, and to captain in May, immediately after Fort Sumter. Although Sheridan assumed that Jubal Early was effectively out of action and he considered withdrawing his army to rejoin Grant at Petersburg, Early received reinforcements and, on October 19 at Cedar Creek, launched a well-executed surprise attack while Sheridan was absent from his army, ten miles away at Winchester. Hearing the distant sounds of artillery, he rode aggressively to his command. He reached the battlefield about 10:30 a.m. and began to rally his men. Fortunately for Sheridan, Early's men were too occupied to take notice; they were hungry and exhausted and fell out to pillage the Union camps. Sheridan's actions are generally credited with saving the day (although Maj. Gen. Horatio G. Wright, commanding Sheridan's VI Corps, had already rallied his men and stopped their retreat). Early had been dealt his most significant defeat, rendering his army almost incapable of future offensive action. Sheridan received a personal letter of thanks from Abraham Lincoln and a promotion to major general in the regular army as of November 8, 1864, making him the fourth ranking general in the Army, after Grant, Sherman, and Meade. 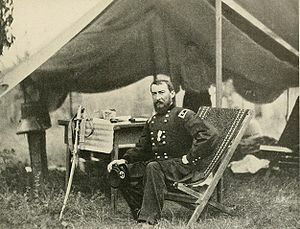 Grant wrote to Secretary of War Edwin M. Stanton after he ordered a 100-gun salute to celebrate Sheridan's victory at Cedar Creek, "Turning what bid fair to be a disaster into glorious victory stamps Sheridan, what I have always thought him, one of the ablest of generals." 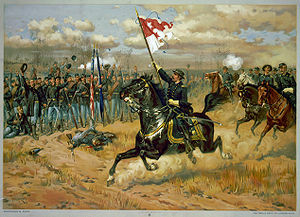 A famous poem, Sheridan's Ride, was written by Thomas Buchanan Read to commemorate the general's return to the battle. Sheridan reveled in the fame that Read's poem brought him, renaming his horse Rienzi to "Winchester," based on the poem's refrain, "Winchester, twenty miles away." The poem was widely used in Republican campaign efforts and some have credited Abraham Lincoln's margin of victory to it. After Gen. Lee's surrender, and that of Gen. Joseph E. Johnston in North Carolina, the only significant Confederate field force remaining was in Texas under Gen. Edmund Kirby Smith. Sheridan was supposed to lead troops in the Grand Review of the Armies in Washington, D.C., but Grant appointed him commander of the Military District of the Southwest on May 17, 1865, six days before the parade, with orders to defeat Smith without delay and restore Texas and Louisiana to Union control. 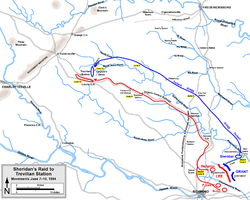 However, Smith surrendered before Sheridan reached New Orleans. Grant was also concerned about the situation in neighboring Mexico, where 40,000 French soldiers propped up the puppet regime of Austrian Archduke Maximilian. He gave Sheridan permission to gather a large Texas occupation force. Sheridan assembled 50,000 men in three corps, quickly occupied Texas coastal cities, spread inland, and began to patrol the U.S.-Mexico border. The Army's presence, U.S. political pressure, and the growing resistance of Benito Juárez induced the French to abandon their claims against Mexico. Napoleon III withdrew his troops in 1866, and the following year Emperor Maximilian was executed for treason. Sheridan later admitted in his memoirs that he had supplied arms and ammunition to Juárez's forces: "... which we left at convenient places on our side of the river to fall into their hands." On July 30, 1866, while Sheridan was in Texas, a white mob broke up the state constitutional convention in New Orleans. Thirty-four blacks were killed. Shortly after Sheridan returned, he wired Grant, "The more information I obtain of the affair of the 30th in this city the more revolting it becomes. It was no riot; it was an absolute massacre." In March 1867, with Reconstruction barely started, Sheridan was appointed military governor of the Fifth Military District (Texas and Louisiana). 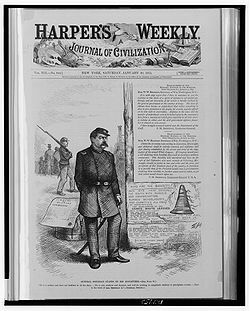 He severely limited voter registration for former Confederates and ruled that only registered voters (including black men) were eligible to serve on juries. Furthermore, an inquiry into the deadly New Orleans riot of 1866 implicated numerous local officials; Sheridan dismissed the mayor of New Orleans, the Louisiana attorney general, and a district judge. He later removed Louisiana Governor James M. Wells, accusing him of being "a political trickster and a dishonest man." He also dismissed Texas Governor James W. Throckmorton, a former Confederate, for being an "impediment to the reconstruction of the State," replacing him with the Republican who had lost to him in the previous election. Sheridan had been feuding with President Andrew Johnson for months over interpretations of the Military Reconstruction Acts and voting rights issues, and within a month of the second firing, the president removed Sheridan, stating to an outraged Gen. Grant that, "His rule has, in fact, been one of absolute tyranny, without references to the principles of our government or the nature of our free institutions." The Indians on the Great Plains had been generally peaceful during the Civil War until 1864 when raids and counteraids in Colorado ignited a war. The protection of the Great Plains fell under the Department of the Missouri, an administrative area of over 1,000,000 mi.², encompassing all land between the Mississippi River and the Rocky Mountains. Maj. Gen. Winfield S. Hancock was assigned to the department in 1866, but had mishandled his campaign, resulting in Sioux and Cheyenne raids that attacked mail coaches, burned the stations, and killed the employees. They also raped, killed, and kidnapped a considerable number of settlers on the frontier. Under pressure from the governors, General Grant turned to Phil Sheridan. In September 1866, Sheridan arrived at the former Fort Martin Scott near Fredericksburg, Texas, where he spent three months subduing Indians in the Texas Hill Country. In August 1867, Grant appointed Sheridan to head the Department of the Missouri and pacify the Plains. His troops, even supplemented with state militia, were spread too thin to have any real effect. He conceived a strategy similar to the one he used in the Shenandoah Valley. In the Winter Campaign of 1868–69 he attacked the Cheyenne, Kiowa, and Comanche tribes in their winter quarters, taking their supplies and livestock and killing those who resisted, driving the rest back into their reservations. Professional hunters, trespassing on Indian land, killed over 4 million bison by 1874, and Sheridan applauded: "Let them kill, skin and sell until the buffalo is exterminated". When the Texas legislature considered outlawing bison poaching on tribal lands, Sheridan personally testified against it, suggesting that the legislature should give each of the hunters a medal, engraved with a dead buffalo on one side and a discouraged-looking Indian on the other. Comanche Chief Tosawi reputedly told Sheridan in 1869, "Me, Tosawi; me good Injun," to which Sheridan supposedly replied, "The only good Indians I ever saw were dead." Sheridan denied he had ever made the statement. Biographer Roy Morris Jr. states that, nevertheless, popular history credits Sheridan with saying "The only good Indian is a dead Indian." This variation "has been used by friends and enemies ever since to characterize and castigate his Indian-fighting career." Philip Sheridan suffered a series of massive heart attacks two months after sending his memoirs to the publisher. At 57 years of age, hard living and hard campaigning and a lifelong love of good food and drink had taken their toll. Thin in his youth, he had reached over 200 pounds. After his first heart attack, the U.S. Congress quickly passed legislation to promote him to general and he received the news from a congressional delegation with joy, despite his pain. His family moved him from the heat of Washington and he died of heart failure in his summer cottage in the Nonquitt section of Dartmouth, Massachusetts, on August 5, 1888. Philip Sheridan, Jr., followed in his father's footsteps and graduated near the bottom of the West Point class of 1902. He served as a cavalry officer, a military aide to President Theodore Roosevelt, and in Washington with the general staff. He was promoted to major in 1917 and was also felled by a heart attack, at age 37, in February 1918. Sheridan is the only person to be featured on a U.S. ten dollar bill who was strictly associated with the military and not politics. He is featured on both Five and Ten Dollar bills. Fort Sheridan in Illinois was named to honor General Sheridan's many services to Chicago. An equestrian statue of Sheridan by Gutzon Borglum (sculptor of the figures on Mt. Rushmore) at Belmont Avenue and Sheridan Road in Chicago depicts the general on his horse, Rienzi. Sheridan Road begins in Chicago, continues mostly along the shoreline of Lake Michigan for about 60 miles through the North Shore suburbs and leads to the Town of Fort Sheridan and ultimately Racine, Wisconsin. The landmark former U.S. Army base named for the general is now an upscale residential community. The Rifleman (1958), featured in an episode "The Sheridan Story" where he helps a wounded Confederate veteran on Lucas McCain's ranch. It is revealed that McCain, played by Chuck Connors, served under Sheridan during the war. The Rebel (1960), featured Andrew J. Fenady in the role of Sheridan in the episode "Johnny Yuma at Appomattox". In Sherman Alexie's novel Reservation Blues, Sheridan is portrayed as a head hunter for a record label responsible for the downfall of the novel's protagonist's band Coyote Springs. The link between the real Sheridan and the character in the book is made explicit in a brutal dream experienced by one of the characters. J. Michael Straczynski has stated that the character of Captain John Sheridan in the Babylon 5 television series was intended to be a direct descendant of General Sheridan. ↑ 1.0 1.1 Eicher, p. 482. Sheridan claimed Albany since he was 17, but alternative possibilities include: Somerset, Ohio, on September 6, 1831; onboard a ship sailing to New York from County Cavan, Ireland; Boston, Massachusetts. Morris, pp. 10–11, points out that Sheridan harbored presidential ambitions from an early age and could have deliberately claimed a U.S. birthplace to retain eligibility for the office. Wittenberg, pp. 142–43, argues strongly for Ireland, citing a stone marker on the parents' former house and county parish records. ↑ Morris, pp. 10–11, states "on or about March 6" and that Sheridan himself claimed various dates and birthplaces on different occasions in his life. ↑ Morris, p. 15; Fredriksen, p. 1760, claims that Sheridan lied about his age to enter the Academy. ↑ 6.0 6.1 6.2 6.3 6.4 6.5 6.6 Eicher, pp. 482–83. ↑ O'Connor, pp. 54–56; Morris, pp. 41–46. ↑ Wittenberg, pp. 4–5; Morris, pp. 41–59; Hess, p. 276. ↑ Sherman, vol. 1, p. 166. ↑ Morris, pp. 104–111, 116. ↑ Cozzens, pp. 376–90, 466–67; Wittenberg, p. 11; Morris, pp. 127–36. ↑ Morris, pp. 153, 155. ↑ Morris, pp. 172–81; Wittenberg, pp. 33–41. ↑ Eicher, p. 482; Wittenberg, pp. 58–60; Morris, pp. 182–84. ↑ Wittenberg, pp. 75–79, 82; Morris, pp. 210–21; Eicher, p. 483; Official Records, Vol. XLIII, Part 2, p. 423. ↑ Morris, pp. 349–54, 364–65. ↑ "Fort Martin Scott". The Handbook of Texas. http://www.tshaonline.org/handbook/online/articles/FF/qbf33.html. Retrieved August 29, 2009. ↑ Fredriksen, p. 1762; Morris, pp. 309–24, 342–49, 357–64, 368, 373–76. ↑ Whittlesey, Lee (1988). Yellowstone Place Names. Helena, MT: Montana Historical Society Press. p. 107. ISBN 0-917298-15-2. ↑ Ken Burns, PBS website page 5 of The National Parks pages. Accessed September 28, 2009. ↑ Morris, pp. 350, 384. ↑ "The "Academy" Must Now Share Michael Moore`s Cinematic Shame". Nra-Ila. 2003-03-27. Archived from the original on 2010-12-03. http://web.archive.org/web/20101203095618/http://www.nraila.org/News/Read/NewsReleases.aspx?id=2479. Retrieved 2010-11-21. ↑ Example notes are displayed on the Federal Reserve Bank of San Francisco website. ↑ "National Register Information System". National Register of Historic Places. National Park Service. 2010-07-09. http://nrhp.focus.nps.gov/natreg/docs/All_Data.html. This article incorporates text from a publication now in the public domain: Herbermann, Charles, ed (1913). "Philip Henry Sheridan". Catholic Encyclopedia. Robert Appleton Company. "Sheridan, Philip Henry". The Nuttall Encyclopædia. 1907.